MEMBER for Northern Tablelands Adam Marshall today visited The Armidale School (TAS) to inspect the new CORSnet antenna which has been installed by the State Government to increase the accuracy of GPS tracking in the region. Mr Marshall said the antenna was part of the NSW network of permanent Global Navigation Satellite System (GNSS) tracking stations which are owned and operated by the State Government, used to improve the accuracy of satellite positioning for the surveying, construction and precision agricultural sectors. 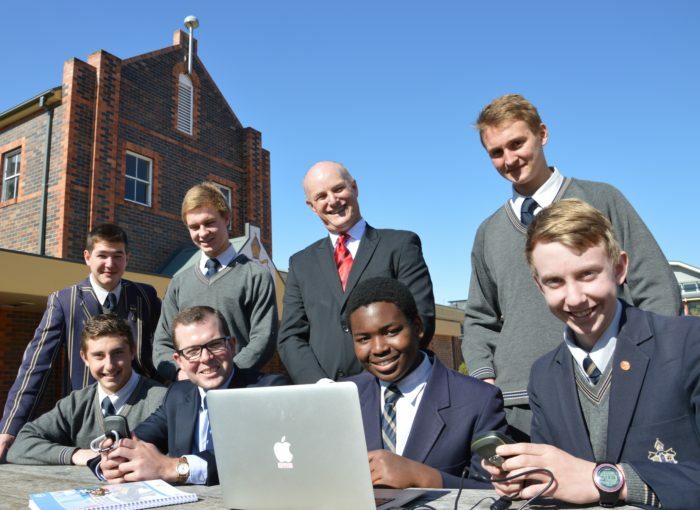 “TAS was chosen as a location for this new antenna as the school is part of the Geoscience Australia GPS in Schools program, which aims to foster student interest in surveying and spatial information, with a particular focus on satellite mapping technology,” Mr Marshall said. “In addition to the infrastructure, the school has received an education package and a number of hand-held Garmin GPS receivers to utilise in practical sessions to learn about mapping, navigation, distance and area measurements. Mr Marshall said the CORSnet system would also be vital to delivering the $74.1 million of upgrades to roads and bridges across the Northern Tablelands announced in the recent state budget. Mitch Hanlon from Mitchel Hanlon Consulting said the infrastructure was vital to the economy of the Northern Tablelands and was pleased to see collaborating efforts to implement educational programs that deliver benefits to students and to the surveying profession alike. “This satellite infrastructure will support new road and rail infrastructure upgrades, and the agricultural sector,” Mr Hanlon said. “There is a current shortage of surveyors and we hope that the GPS in Schools program will encourage students to consider a profession where there are excellent job prospects well into the future. “Over the last decade we just haven’t had enough people taking up surveying as a profession. “There is currently a strong demand for surveyors, particularly registered surveyors and we expect that the shortage will continue for the foreseeable future until we can train more people.